Two days away in fact, and I am quite nervous. It’s a funny distance race which I’ve blogged about before (here). 7 mile swim, 61 mile bike and then a marathon. I’ve swam over 100 miles so far this year, which is more than I’ve ever done in a full year, although my longest swim has been 7km, not 7 miles, and I didn’t look too good at the end. Cycling should be OK, although I don’t have a Tri-bike any more, or even clip on tri bars. I’m not too worried as I know from experience that getting aero after a 7 mile swim is hard, as my neck, back, shoulders and arms will all be tired from the swim. As for the marathon, I’ve done one half marathon this year, which was slow and painful, and I’ve been plagued by an injured calf muscle, so we’ll see how it goes. I don’t want to pull out, but I don’t want to injury myself for the rest of the year. Race clothing? 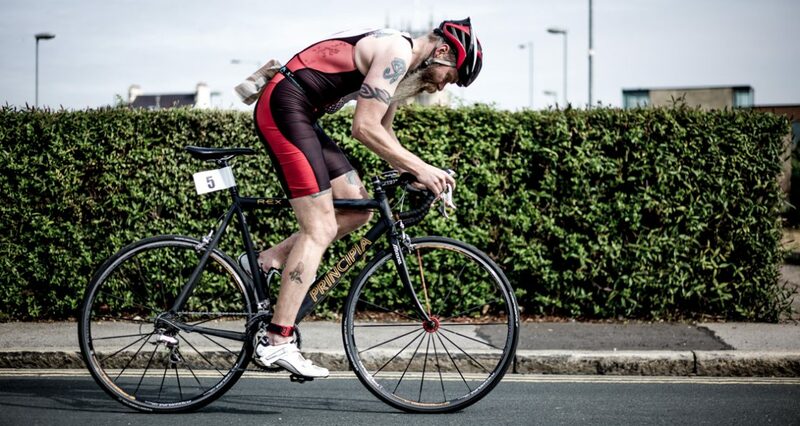 Last weekend I went out cycling wearing my tri-suit, which felt very strange. It does look good though. My shoulders did get a little burnt from the sun, as they are generally never exposed. The forecast is high 20’s and very little shade on the bike or run. Therefore, I made an emergency purchase of some tri-shorts from Wiggle. I’ll wear these for the whole race, but put on a cycling top for the bike leg, and a T-shirt for the run. I went for a steady 3km run in my new shorts this morning and they feel good, and match my running shoes, which is nice. I don’t have a time in mind for finishing, although sub 11 hours would be nice. Here’s hoping it all goes well. It’s been far too long since I blogged. Months in fact. I’ve been busy, which isn’t really an excuse because everyone is. Not blogging is an easy habit to get into, you miss a week or two and then before you know it, it’s been three months. I’ll start my catching up on a couple of books that I’ve read recently, both exercise related. Salt, Sweat, Tears, as the cover implies, is all about the men (and women) who have rowed the oceans, from the very first over a hundred years ago to the more recent, including Adam himself. If the book was just about Adam’s crossing of the Atlantic I probably wouldn’t have picked it up, but it’s the chapters in between that make the book stand out, as well as interviews with some of the iconic figures in the ocean rowing scene. I’m not a rower and have no intention of becoming one, but one thing that made me chuckle was when Adam mentioned his ‘crunchy’ tendons. I suffered from this for a week after I finished my triple ironman (read about it here) and it isn’t particularly pleasant. Rowing fan or not I think you’ll like this book. Sean Conway is a man that really doesn’t need an introduction. This is the third book of his that I’ve read and I devoured this one over a weekend in the lake district. He had already cycled and swam Lands End to John O’Groats, so he ‘only’ had to complete the run for the length of Britain triathlon. Unsupported long distance running is tough as you have to carry everything, and Sean had to contend with bad weather and as you would expect, the odd injury. The book was very easy to read and I love reading about the sections I know well. As any long distance runner will understand, the speed that he was ‘running’ was decidedly pedestrian at times. One gripe was that he dismissed Youth Hostels, saying that he wouldn’t ever stay in them again for various reasons. I like them as you always get to meet new people, they have somewhere secure for your bicycle and they are a whole lot cheaper than a hotel, especially if you’re travelling alone. Minor gripe aside, this was another great book, and I am looking forward to reading about his successful world breaking ride across Europe.